Raise the minimum wage, reduce worker pay. That’s not what the left promised, but that’s what’s happening in Seattle, which is phasing in a $15-an-hour minimum wage. Bizuayeh Tesfaye/Las Vegas Review-Journal Residents and workers join a minimum-wage protest outside a fast-food restaurant in Las Vegas. 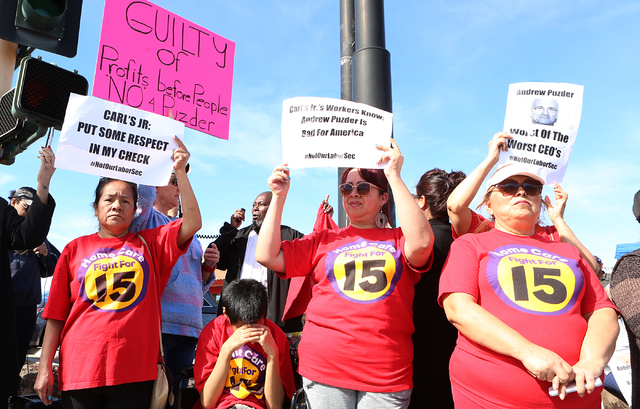 Bizuayehu Tesfaye/Las Vegas Review-Journal Petrade Santos, left, Irma Calzadillas and Bertha Nabarro joined other workers at a minimum-wage protest outside of a Carl's Jr. on 2100 Fremont St., Feb. 13, 2017, in Las Vegas. Raise the minimum wage, reduce worker pay. That’s not what the left promised, but that’s what’s happening in Seattle, which is phasing in a $15-an-hour minimum wage. 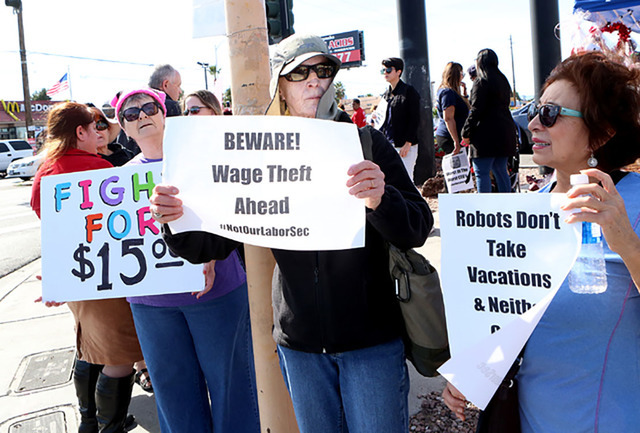 What’s happening in the Pacific Northwest is a clear warning to Nevada politicians who want to hike our minimum wage. Recently, researchers from the University of Washington found that Seattle’s increase in the minimum wage from $11 an hour to $13 an hour reduced hours worked by low-wage employees by 9 percent while hiking pay just 3 percent. For low-wage workers, that represented a $125-a-month reduction in pay. Low-wage employment dropped by 6.8 percent, with more than 5,000 jobs eliminated. This study is forcing some liberals to acknowledge the possibility that quick hikes in the minimum wage can hurt the people they’re intended to help. Adding to the difficulty intellectually honest leftists will have in dismissing this study is the praise heaped on the first study produced by this UW research team. Last year, the researchers looked at the impacts of raising Seattle’s minimum wage from $9.50 to $11 an hour. They found gains in hourly pay were mostly offset by a decline in hours worked and a small reduction in overall employment. Turns out continuing to magnify those effects — higher wages for the lucky workers, job losses and hour reductions for the unlucky ones — is a net loser for low-wage workers. The city had hired those researchers to gauge the impact of its minimum-wage hike. The Seattle officials fired them recently. In a growing economy that includes modest levels of inflation, entry-level wages naturally increase above the floor set by the minimum wage. 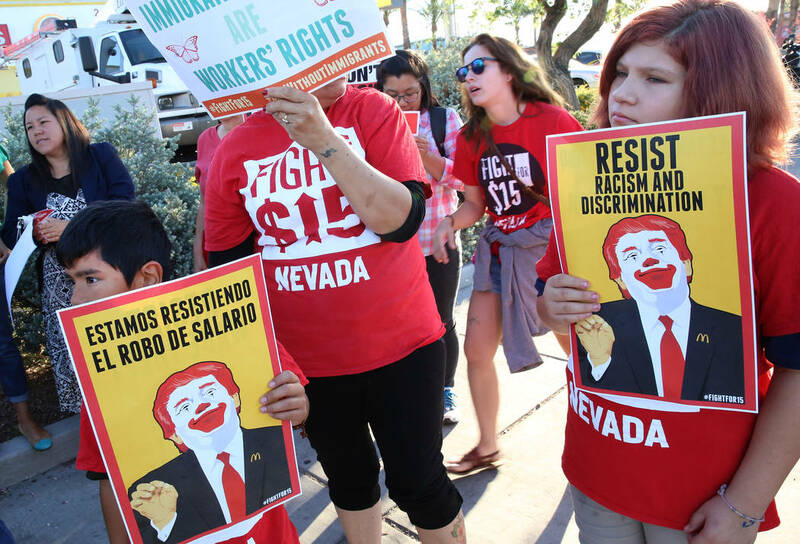 Even minimum-wage advocate state Sen. Yvanna Cancela, D-Las Vegas, acknowledged this year that just 20,000 of Nevada’s 1.2 million workers earn the minimum wage or less. If politicians increase the minimum wage by a small amount, they can claim credit for raising wages — although their actions only accelerate what’s naturally occurring in the labor market. People are hurt by raising the wage floor slowly, but they’re already marginalized. 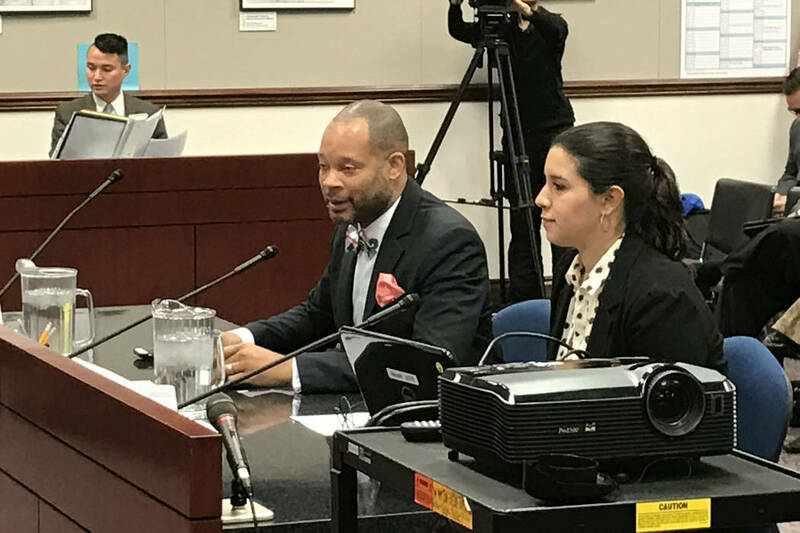 Michael Saltsman, the managing director of the Employment Policies Institute, cites the Census Bureau in noting that some Las Vegas neighborhoods have youth unemployment rates of more than 40 percent. Since these folks are unemployed, making them less employable doesn’t show up in the data. Plus, if half the 20,000 people making the minimum wage lost their jobs, it would be little more than a rounding error in Nevada’s unemployment rate. Raising the minimum reduces the few opportunities the least-advantaged Nevadans have to get a job. Raise it above market rates, and you’ll just be hurting those who are already employed — just like in Seattle.